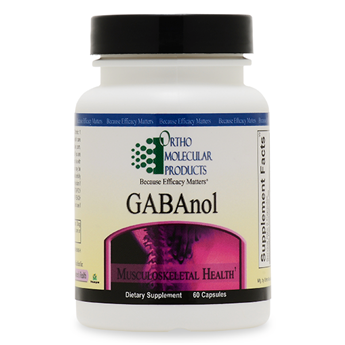 GABAnol is a synergistic combination of gamma-aminobutyric acid (GABA), glycine and established traditional botanicals, which serves as a quick response supplement for muscle relaxation. This unique blend of botanicals, amino acids, vitamins and minerals also work to quickly support muscular discomfort. While other therapies with a similar mechanism may cause dependency when used over time, the natural ingredients in GABAnol are non-habit forming and work quickly to ease muscle tension. The combination of glycine and GABA act as inhibitory neurotransmitters, which help calm muscles and reduce the activity of the excitatory nervous system that can cause muscle spasms. Together with magnesium, B6 and select botanicals, the ingredients in GABAnol serve as an excellent alternative to valerian-based products. One capsule of GABAnol includes 250 mg GABA, 225 mg glycine, 200 mg cramp bark and 150 mg Dong quai.